Magicians deftly handle cards and make it look easy, but there are years of practice that go behind sleight of hand. Luckily for the impatient there are plenty of tricks like this one that use simple math to help the magician amaze his audience. The Magician hands out a deck of cards and has them shuffled, and then takes them back. He counts off a small packet of cards and passes them out and asks the spectator to look at the third from the top and show it around. He then directs them to spell out the name of the card silently while dealing out cards, and then hand the packet back. After a moment the magician is able to name the chosen card! The specific number of cards and the order in which they are counted - all under the magician's control, of course - is the secret to the New Spell Your Card trick. A simple deck of playing cards is all that is required. 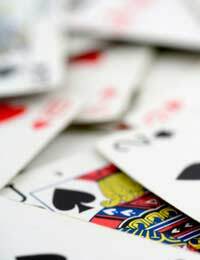 The only sleight needed is a quick peek at the bottom of the packet of cards, and the ability to count to yourself while talking - simple enough, but do practice these techniques. The magician shuffles a normal deck of playing cards while talking about the nature of telepathy and psychic energy. Psychics can become tuned into an object from repeated handling, and the magician claims to have developed a connection with this deck of cards and wants to demonstrate. Getting a volunteer from the audience, the magician deals of nine cards - casually, not calling attention to the fact that there are nine - and then deals off a packet of less or more than nine cards for himself. Handing the first packet with nine cards to the spectator, the magician asks him or her to shuffle while he does the same. He then asks them to select the third card down from the top and show it to everyone but the magician. After putting the card back where it came from, the magician tells the spectator to spell out the name of the card do themselves. The magician demonstrates "Say it is the ten of hearts. You spell out T-E-N, dealing off one card from the top of your packet for each letter, then dropping the packet on top and starting over. O-F. Drop the cards. H-E-A-R-T-S. Drop the cards. Now you do the same." After the spectator is done the magican takes the packet and shuffles while talking. It appears he is thoroughly shuffling, but really he is counting off five cards from top to bottom - this places the chosen card at the bottom of the packet. When he hands the packet back with the words "now give them a good shuffling" he takes a peek at the bottom card. As the spectator shuffles the cards the magician is able to "read his mind" and tell him the chosen card! When demonstrating the counting technique, make sure your packet does not have nine cards, and chose a card that is not the third from the top.